Leading manufacturer and Nigeria’s only total beverage alcohol (TBA) company, Guinness Nigeria Plc, has revved up its commitment to driving responsible drinking behaviour among Nigerian consumers by partnering with the National Youth Service Corps (NYSC) to deliver its innovative and trailblazing DRINKiQ training sessions to officials and corps members in a bid to take the responsible drinking message to every nook and cranny of the country. At the signing of the Memorandum of Understanding between Guinness Nigeria and the NYSC which took place at the Gowon House, National Directorate Headquarters, NYSC in Abuja, on Friday, November 4, the Director General, NYSC, Brigadier General Sule Kazaure, who was represented by Director, Community Development Service and Special Projects, Mrs Rhoda Kaka Kwaki, appreciated the laudable hand of fellowship extended by Guinness Nigeria to help create a society where responsible drinking becomes engrained in the consciousness of many young adults and society at large. Commending Guinness Nigeria for the intervention, she described the partnership as a clear demonstration of the company’s positive disposition towards the welfare and development of Nigerians, particularly the youth. “This DRINKiQ campaign, a form of giving back to the society to be implemented by the Community Development Service and Special Projects is bound to impact positively on the entire society and it is my sincere hope that what we have sown today will blossom into enduring and sustainable entity for the benefit of our communities and environs,” Mrs Kwaki said. Managing Director of Guinness Nigeria Plc, Mr Peter Ndegwa who was represented by the company’s Corporate Relations Director, Mr Sesan Sobowale, described the occasion as historic one and a momentous stride in the right direction with a view to curbing the irresponsible use of alcohol in society. “We are committed to creating awareness about responsible drinking and promoting the enjoyment of alcohol and our brands as part of a healthy balanced lifestyle. We also believe that efforts to reduce the misuse of alcohol are most effective when governments, society, individuals, families as well as industry work together. 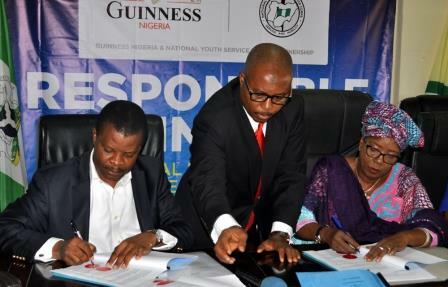 “Therefore, our approach is built around providing consumers with information promoting rigorous company and industry standards for responsible marketing, supporting effective programmes and partnerships as the one that we are signing today to promote alcohol education and to tackle misuse and advocating effective evidence-based policy,” Mr Sobowale enthused. Other dignitaries present at the occasion include Sustainable Development/ Alcohol in Society, AiS Manager, Guinness Nigeria, Osita Abana; Director, Legal Service, NYSC Directorate NHQ, Barrister Tijani Ibrahim; Director, Planning, Research and Statistics, Chief Anthony Ani;, Director, Press and Public Relations, Mrs Bose Aderibigbe; Director, Corp Welfare and Inspectorate, Mrs Victoria Obi Okaku; Director, Certfication, Alh Udu Taura; and Director, Corps Mobilization Chief Frank Ekpenobi. On the scope of the partnership, Mr Sobowale explained that the DRINKiQ programme is one of the training platforms that Guinness Nigeria, has used to leverage its responsible drinking agenda. The training aims to raise the public’s awareness about alcohol so that people can have a better understanding of the drinking choices that they make, including the decision not to drink, when to drink and how much to drink. In view of this, the programme would start with Train-the-Trainers, ToT programme, that will equip NYSC officials (drawn from the 36 states of the federation) with information and knowledge about responsible drinking. These officials will then provide trainee corps members with practical tips, strategies and confidence they need to become champions for responsible drinking in their communities. It would be recalled that last year, Guinness pioneered the use of breathalyzers by the Federal Road Safety Commission via its donation of breathalyzers to the safety agency to enable it check the incidence of drunk-driving on Nigerian roads during the ember months. Other initiatives include the Age Verification Programme, sponsorship of a radio programme, DRINK DIARIES, on Lagos Traffic radio 96.1 FM as well as advertorials and out-of-home messaging aimed at educating the general public on the dangers of drink-driving.